Being emotionally available is key to progressing and developing. We know from reading and research that children who are not ready to learn because of emotional difficulties, struggle to make progress and develop as perhaps they might. At our school we are passionate about the development of children and have been looking very closely at how the brain develops and also deals with trauma and upset. What is a trauma for one child, could mean nothing to another. We know that when a child is mid 'tantrum' or in a 'mood', that it can be tricky to shake it off or 'stop'. To ensure that children can self-regulate and build up coping strategies and resilience to face such times, they need adult support. We teach a child to count, why shouldn't we teach a child to deal with a 'bad mood'. All our staff have received training on how the brain works, how the brain reacts to trauma and upset and what we can do to support them and ensure that this takes precedent over learning new skills and furthering their academic development. If we recognise that your child has a need or issues that is ongoing and not being resolved through everyday support and care, we will speak to you regarding this and look at what to do next. We have lots of different strategies to draw upon as a staff that we will review and match to your child's needs. Some of these strategies are known as Positive Play, Nurture and Thrive and we have staff at Nursery qualified in these interventions. 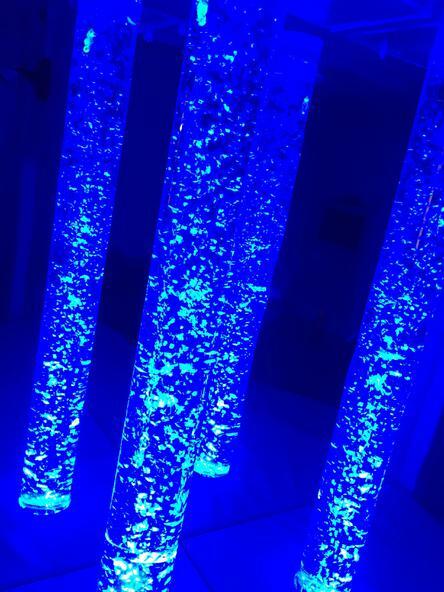 The majority of the sessions take place in our sensory room which provides a safe, relaxing and supportive environment in which children can share and learn. In BubbleTime, which is named as a result of the much loved bubble tube in the sensory room, children often follow a Positive Play program if needed, or have content that is planned specifically for them. At our school, we have been researching and doing further learning around the wellbeing of children and how they can label and verbalise their feelings. We know that children need to recognise their feelings and be able to self-regulate their emotions in relation to that feeling. Bubble Time through the Positive Play Program can help children with confidence and self esteem. It can help to improve their social skills such as sharing and taking turns and develops their communication.Our aims of the sessions are to empower the children to feel special and good about themselves and are encouraged to express themselves and communicate their feelings in a variety of ways. We also use Positive Play sessions for difficult times in our lives when a child just needs an extra special calming moment to chat or just 'be', to have something explained in a way that is easier to understand, or just to know that they matter. Thrive sessions are more structured in process as it is a licensed program that involves an assessment of need first to then direct the practitioner to the most suitable and relevant activities. The practitioner must be qualified in 'Thrive' in order to implement the program. The sessions take place wherever they are needed, this might even be playing in Nursery with the child's friends but are personalised moments that are built up over time to hopefully resolve the issue or improve the need that was first recognised. When we feel that your child may need to access Bubble Time, Positive Play or Thrive sessions or have some special time, we will contact you to gain your consent and to explain why we are putting in this extra support. These sessions will be part of wider conversations about the needs that your child has. If you have any concerns or questions relating to any of the above information, please do not hesitate to speak to Ruth at school.